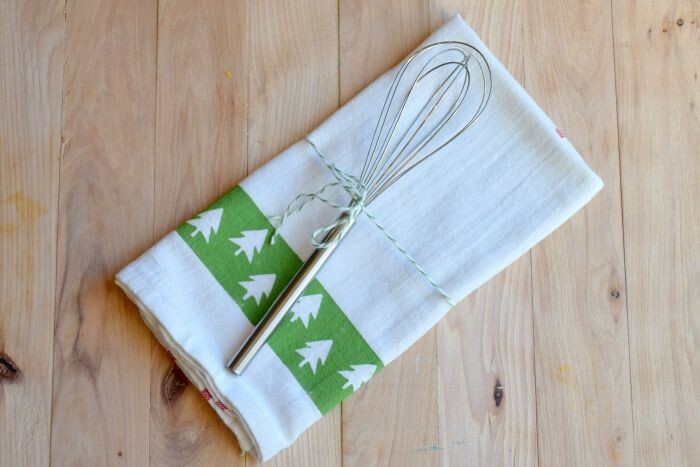 Ever found yourself in need of a quick hostess gift for a last-minute party? This diy easy hostess gift is just the ticket. It took me less than 10 minutes to make and needed about 4-5 hours to dry. Ever woke up and realized you had a party to attend that evening and you didn’t have a hostess gift? Well I have just the thing for you! Your tea towel needs to be prewashed and iron before starting. 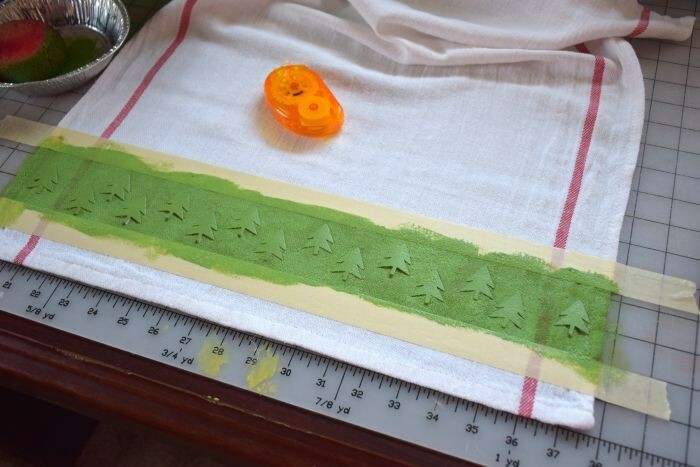 I have a paper stencil with evergreen trees on it. 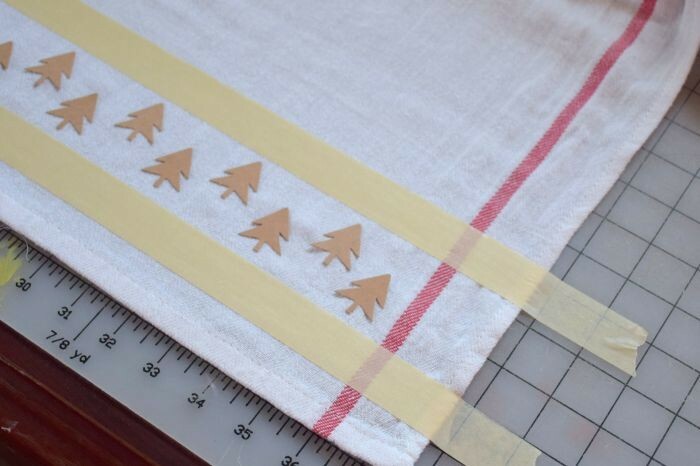 I was going to use the stencil and paint green trees on the towel, but as I’m punching out the little trees I had a better idea! I used the masking tape to create clean, evenly spaced lines to paint between. 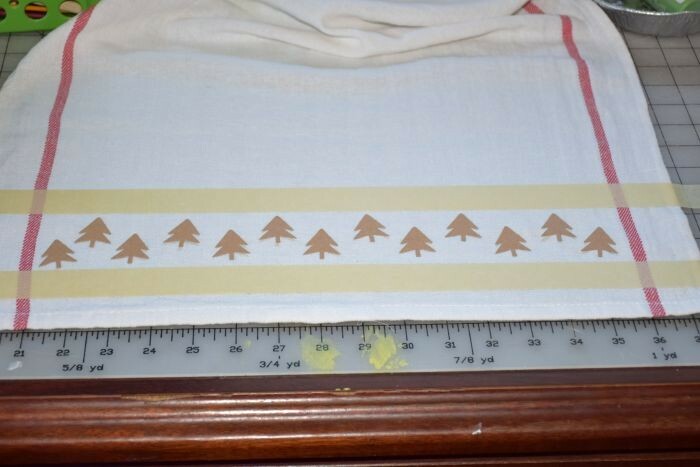 Then I used the double stick tape to adhere the trees between the tape lines. If you are using a stencil, I recommend using the double-stick tape and the masking tape to keep it in place as well. You want the edges to lie as close to the fabric as possible to prevent bleeding. Another idea would be to use shaped stickers between your masking tape lines. Star or candy cane stickers would be one such example. You can place them perfectly even or stagger them a little the way I did. Because these are paper cut-outs, the wet paint makes them want to curl up a little. I had to paint quickly and evenly. I found that it worked best to get a good layer of paint on my sponge and just quickly dab one area good before moving to the next area. 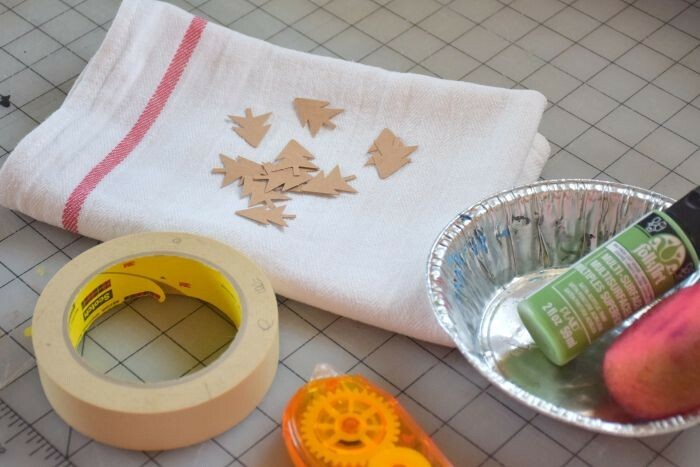 Let your paint dry for 5-10 minutes before carefully peeling up your stencil or stickers. Let dry for 4-5 hours. This paint dries pretty quickly so it should be completely dry in 4 hours or so. 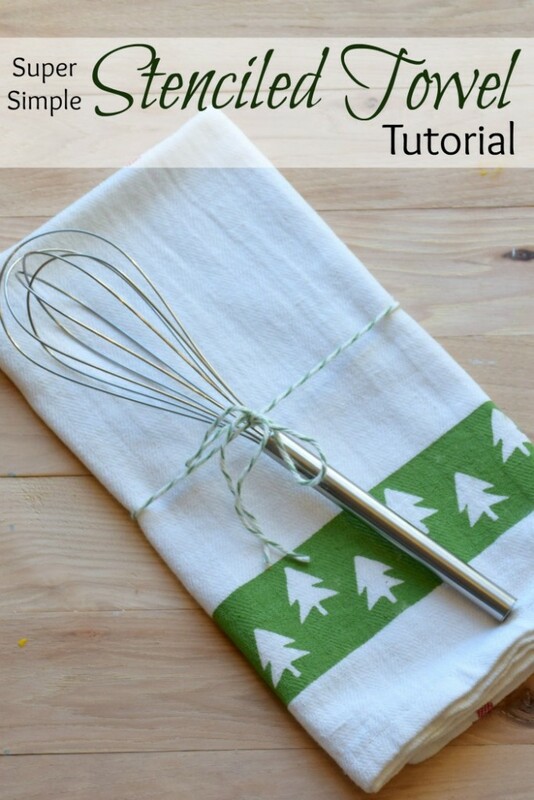 Fold it pretty, add a cooking utensil or anything else you want and tie a ribbon around the entire thing. Perfect! The multi-surface paint is great on fabric. It does leave the painted area stiff, so I suggest painting only a small area of the towel. Would you enjoy receiving this DIY Easy Hostess Gift? I LOVE this idea and would love to receive one too! I’m always looking for a cute, quick and made from the heart gift to give and this is perfect! Thanks for sharing! These are so so cute! I just love them! So CUTE! I especially appreciate the fact that you don’t need a special cutting machine for this project — THANKS for sharing! What a wonderful idea, I love it! !